Lyme disease (LD) is the most common vector-borne disease of humans in the U.S., with most cases acquired from the bite of nymphal blacklegged ticks (= ‘deer ticks’). These ticks are found throughout the eastern U.S. (see map), yet 93% of LD cases occur in ten Northeast, Mid-Atlantic and Upper Midwest states. 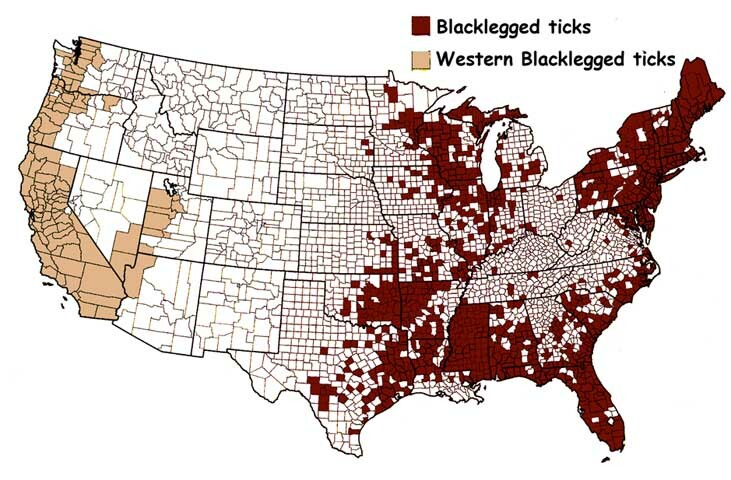 Various explanations have been proposed for the puzzling absence of LD in some areas where blacklegged ticks occur, but no agreement has been reached – contributing to uncertainty and confusion among citizens and healthcare providers faced with expanding tick populations in many parts of the U.S. This 6-year research program is a collaborative effort -- led by Michigan State University and involving The University of Tennessee, The University of Montreal, Hofstra University, Georgia Southern University, The University of Rhode Island, and the U.S. Geological Survey. The program aims to understand the ecological drivers for the geographic variation in Lyme disease risk in eastern North America. We will test three key hypotheses concerning LD distribution using field, laboratory, and computer modeling studies. Data on tick-host relationships, tick seasonal biology, and tick genetics will be collected from field sites in four widely-separated regions of the eastern U.S. (Here are some of our sites in the Northeast, Northwest, Southeast and Southwest). Application of modeling and molecular tools will unravel the ecological and evolutionary processes responsible for the variation in LD risk in different regions of the U.S., as well as help predict how climate change could alter this risk. Our goal is that this improved understanding of factors determining the distribution and abundance of infected ticks will assist in human disease diagnosis and treatment, tick control measures, and public education on regional differences in the risk of LD and other tick-borne disease. This material is based upon work supported by the National Science Foundation under Grant No. 0914397. Any opinions, findings, and conclusions or recommendations expressed in this material are those of the author(s) and do not necessarily reflect the views of the National Science Foundation.